It still may be too early for comfort food: the days are fairly sunny and warm, and it’s still light out at 7pm. But when those cooler, darker days roll around (or if you just want a preview) this quick and easy recipe fits the bill. My favorite part of this dish is the mouthfeel. 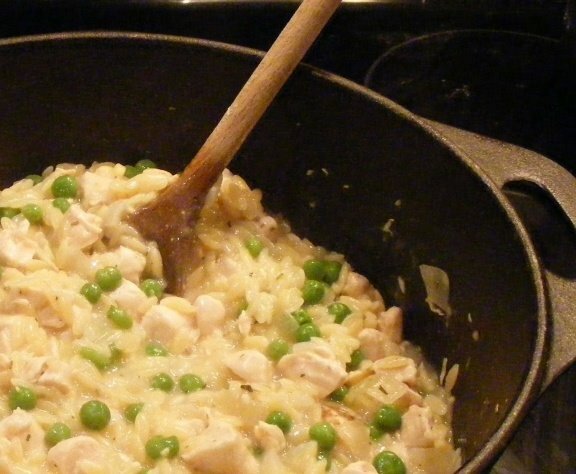 It’s like eating risotto but with only a fraction of the work. Even reheating it in the microwave the next day yields a fantastic creaminess. In dutch oven, heat oil over medium heat. Add chicken and cook until opaque; add garlic and cook for 30 seconds, being careful not to let the garlic burn. Add water and broth to the pan and bring to a mixture to a boil. Once boiling, add pasta and return to a boil. Reduce heat and simmer 9 minutes, stirring occasionally. Add peas, and continue to cook until the peas are heated through and the pasta has absorbed all the liquid, stirring occasionally. Remove from heat and stir in 1/4 cup cheese, herbs, salt and pepper. Top each serving with 1 tablespoon cheese.